See what’s new and back by popular demand. Register today to secure your spot before it’s too late. LISTEN – Hear valuable insight and guidance from 150+ industry, government and regulatory speakers. LEARN – Discover new perspectives and receive the latest updates on top compliance and regulatory topics. 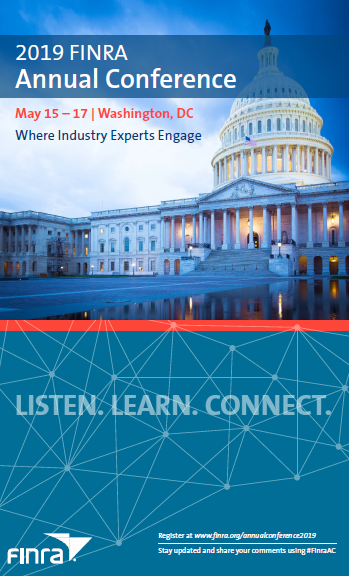 CONNECT – Exchange ideas with peers and industry experts at 15+ networking events, engage in one-on-one discussions with FINRA staff and meet with 50+ exhibitors offering compliance products and services. View the online brochure for the 2019 Annual Conference. Some sessions will be video broadcast live online. Online participants receive access to all conference materials, and can ask questions in real time. Since recordings of most sessions will be made available on-demand after the conference, participants can catch up on sessions they miss live. A room block is available at the Marriott Marquis at the special rate of $341 per night, plus tax. This rate is available until May 3, 2019 or until the room block is sold out. Hotel reservations will then be accepted on a space- and rate-available basis. To reserve a room, you must first register as an attendee for the conference. After you register, you will have the opportunity to book your hotel reservation within the FINRA registration system. Please contact us with any additional questions. View registration options for live broadcast. The special discounted rate for the first 100 in-person registrants is non-refundable. For all other registration categories, a full refund—less a $150 processing fee—will be granted to written requests received 14 days or more prior to the start date of the program. Refunds will not be granted after May 1, 2019. *Available to firms registering 3 or more employees at the same time with the same credit card. Please follow instructions in registration system. Conference fees include attendance to all sessions and conference materials, scheduled breakfast, lunches and receptions. Conference registration is limited and available on a first-come, first-served basis. Payment is required at the time your registration is submitted. You will receive an email confirmation of your completed registration form and payment. Please make sure your registration has been confirmed prior to your arrival onsite at the conference. Travel Disclaimer: FINRA suggests that you do not purchase restricted or nonrefundable tickets for travel to the conference, especially prior to receipt of your registration confirmation. FINRA assumes no liability for penalties or fare increases should the conference sell out or in the unlikely event that changes to the conference dates and/or location become necessary. If you are interested in being an exhibitor at the 2019 Annual Conference, contact Jeff Arcuri at (508) 759-8180 or via email. This event is open to the media. There is no charge for media covering the conference, but registration is required. Please contact us with any media inquiries. 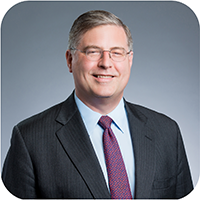 Robert W. Cook is President and CEO of FINRA, and Chairman of the FINRA Investor Education Foundation. From 2010 to 2013, Mr. Cook served as the Director of the Division of Trading and Markets of the U.S. Securities and Exchange Commission. Under his direction, the Division’s professionals were responsible for regulatory policy and oversight with respect to broker-dealers, securities exchanges and markets, clearing agencies and FINRA. In addition, the Division reviewed and acted on over 2,000 rule filings and new product listings each year from self-regulatory organizations, including the securities exchanges and FINRA, and was responsible for implementing more than 30 major rulemaking actions and studies generated by the Dodd-Frank and JOBS Acts. He also directed the staff’s review of equity market structure. Immediately prior to joining FINRA, and before his service at the SEC, Mr. Cook was a partner based in the Washington, DC, office of an international law firm. His practice focused on the regulation of securities markets and market intermediaries, including securities firms, exchanges, alternative trading systems and clearing agencies. During his years of private practice, Mr. Cook worked extensively on broker-dealer regulation, advising large and small firms on a wide range of compliance matters. Mr. Cook earned his J.D. from Harvard Law School in 1992, a Master of Science in Industrial Relations and Personnel Management from the London School of Economics in 1989, and an A.B. in Social Studies from Harvard College in 1988. 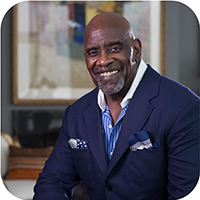 Chris Gardner is an international motivational speaker, Entrepreneur, Best Selling Author, and single parent. Gardner’s autobiography, the Pursuit of Happyness, became a New York Times #1 best seller, and has been translated into over forty languages. Gardner is also the inspiration for the critically acclaimed movie, “The Pursuit of Happyness” for which Will Smith, starring as Gardner received a Golden Globe, Screen Actors Guild and Academy Award nominations for his performance. Gardner’s second best book, also a best seller, “Start Where You Are,” was published in 2009 and is currently working on his third book “Spiritual Genetics and the New Universal Dream” Gardner has recently produced his first film, a documentary entitled Maya Angelou- And Still I Rise. Mr. Gardner considered Mrs. Angelou a very good friend and mentor. Mr. Gardner has “re-enlisted” in the US Military and works closely with the U.S. Veterans Administration to end homelessness amongst veterans! Mr. Gardner is a major supporter of food banks and pantries across the US. Chris Gardner’s aim, through his speaking engagements and media projects is to help others achieve their full potential. Bari Havlik is Executive Vice President for Member Supervision. In this capacity, Ms. Havlik leads FINRA's Member Regulation program, which includes surveillance and examination programs for member firms. 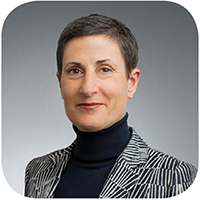 Previously, Ms. Havlik was a Senior Vice President and Chief Compliance Officer for The Charles Schwab Corporation. She began her career in financial services in 1982, and has worked for discount brokerage, full service retail and institutional securities firms, as well as bank-affiliated broker-dealers. Ms. Havlik received her undergraduate degree from DePaul University. She serves on the board of Creativity Explored, a non-profit that gives artists with developmental disabilities the means to create and share their work with the community, celebrating the power of art to change lives. Before relocating to New York, she also served on the board of GirlVentures, a non-profit that inspires girls to lead through outdoor adventure, inner discovery and collective action. Add the FINRA Annual Conference to your calendar. Want to learn more about the CRCP® program? Join CRCP graduates and FINRA staff for lunch at the 2019 FINRA Annual Conference. Hear information about the elite program and network with compliance professionals from organizations across the country. Want to attend the CRCP luncheon and the 2019 FINRA Annual Conference? View more information and register today.